Ch. 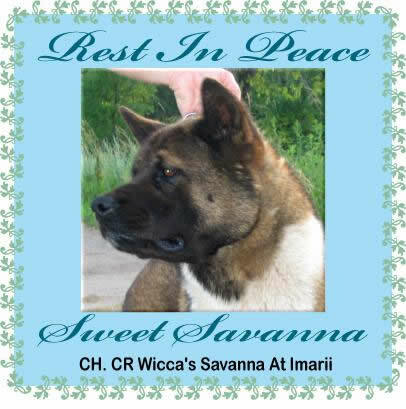 CR Wicca’s Savanna At Imarii, Savanna was a true love and I will be forever grateful to her previous owners, Pam Glave and JoAnn Charnik and breeder Carla Burke, for allowing her to live with us and become such a vital part of our breeding program. Her bone, type, and movement were just her visible qualities. Her loving attitude and temperament was unsurpassed. She has many Champion kids to carry on her legacy. She will be forever missed.